A crazy idea could turn in a great way to make money online, if you have creativity, determination and no fear on what people will tell you at the beginning. There is no insanity if at the end you arrive to success ! Change has always scared people, especially if you are in a small community. Think with our own heads is always the best thing to do and people as recounted below have done the same thing. Here you can find some of the most popular crazy money making ideas, in no particular order. Alex Tew, a 21 year-old college student in England, created in 2005 this site in order to raise money for his university education. 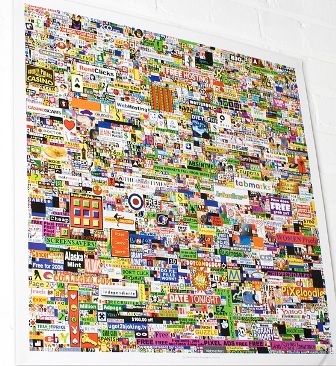 The idea was to make just a page with a million pixels arranged in a 1000 × 1000 grid and the image-based links on it were sold for 1 dollar per pixel in 10 × 10 blocks. Within 4 months he had sold a million pixels ! The interesting part is that with the first 1000 dollars of sales, he bought a press release which he distributed to media sources. This website then became an internet legend (with a lot of clones). You can read the full history and information at the related Wikipedia page. Doggles produce sunglasses for dogs in the form of tinted goggles designed to fit the shape of the dog’s head. Naturally a pair of goggles is a sort of thing that a dog does not really need, but this idea, started online, made huge money and real stores have opened up all over the world. Doggles were invented by Ken and Roni di Lullo after they noticed their dog squinting in the sunlight. This was the original idea and then they continued expanding their product line to include vests, other eyewear and even jewelry. A really strange, but nice idea if you think that people will spend countless dollars on their pets. See the complete history on related Wikipedia page. Cameron Johnson (born 13 November 1984) is an author, businessman, entrepreneur and internationally recognized public speaker. He started his first business when he was nine years old, making greeting cards. At age 12, Cameron made $50,000 selling his sister’s Beanie Babies on Ebay. At age 15, his company was generating $15,000 per day in revenue and he had made his first million before graduating high school. In 2000, while 15, he became the youngest American appointed to the board of a Tokyo-based company. His latest venture is CertificateSwap, that allows users to swap out unwanted gift certificates just sold for six-figures. He is surely a guy plenty of entrepreneurship. Byron Reese had this idea : create a mailbox in North Pole, Alaska and send personalized letters to kids, with signature of “Santa Claus”. He sold 10,000 letters in his first year in business, in 2001. His business increased subsequently every year, he introduced birthday cards from Santa and their sales reached $1 million in 2005. Of course a lot of clones arrived during the years, but this is the original one. FitDeck was founded in 2003 by fitness entrepreneur and inventor Phil Black. He came up with the idea to create this product after combining the fun of a card game that he used to play in college with the rigors of his Navy SEAL training. Phil Black made $4.7 million from this great idea. They sell for $18.95 a pack and obviously, people are interested. This 17 years old girl had a flair for the creative and set up a site to offer layouts for MySpace and free tutorials. She made more than $1 million and she earns as much as $70,000 a month. She owns a website that attracts more than 7 million monthly visitors and 60 million page views. Her first Adsense paycheck was $2,790 and she has already rejected a $1.5 million buyout offer. Her name is Ashley Qualls and she had the idea to create Whateverlife.com . Why wait around for thanksgiving when you could get a wishbone whenever you feel like it? “It’s time you got a Lucky Break“, this is the slogan of a company that mnufacturers and sell plastic wishbones, they produce 30,000 pieces a month and sales have exceeded one million dollars. Another great idea which take inspiration from. The idea is to make money fom matching like-minded individuals or people that have special needs. Or, in the case of PositiveDating, a dating service for the positive community. A great idea is from the woman that created Ashleymadison.com (same name of the founder), a site that offers cheating partner service and affair married dating : “Life is short, have an affair !” (their slogan). This idea arrived to two guys, that created an online yearbook for people and then turned into a social networking site : they have been able to raise more than $4 million in venture capital. The company now has 45 employees, 3 million members and some heavy duty advertisers. Another strange succesfull idea : Jack Wall sells the things that people like to put on the top of car’s antennas, creating a multi-million dollar industry by selling them online. Now, open your mind and Good Luck ! Sometimes it takes a lot of work, other times its just luck. I guess at the end of the day it’s what life has in store for you, are you the hard worked or are you the lucky one? I guess it’s a great combination of the two factors you mentioned. Sometimes I feel that the lucky part is more influental, though! Each any every ideas you have shared is really inspiring specially Cameron Johnson. Thanks for sharing such an interesting post on making money. I don’t know if you heard about this, but someone actually had a great idea of selling or trading his Red Paper Clips for anything or any amount that people want to buy it from. I’m not sure if the site still exists, but I guess it really worked and he actually earned a lot and got lots of stuffs, which he can actually sell for a higher price as well.